If you have a termite problem, it'd be nice to think that using sprays or residual applications are the best way to rid your house of these destructive pests. You don't want to have to go through the upheaval that fumigation requires. You'd rather spray, and forget about it. Sadly, that's a recipe for not fully eliminating the termites, and repeating the whole process over again in a few weeks. For complete termite removal in St. Augustine, FL, only fumigation is the answer. Most sprays only kill adults. 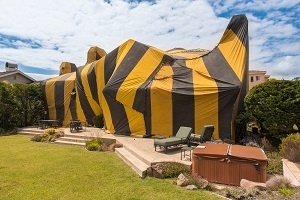 Fumigation, however, can kill adult termites, as well as larvae and eggs. It's not enough to kill some termites, you need to destroy the entire infestation, and only fumigation can do that. Otherwise, you risk the bugs coming back in a matter of weeks. As opposed to other solutions, when you fumigate, you won't have to wait days or weeks to feel the effects. The termites will be gone, usually overnight. Great for a home, but crucial if you're running a business and you don't want to be closed any longer than necessary. Let the fumigators do their work, and it's done as soon as they leave. Using sprays or applications only gets you as far as the places you can see and reach. Gas knows no such barriers. Fumigation can reach into cracks and crevices where termites reside, tracking them down where they live and eradicating them. The last thing you need is to go through the process of extermination, only to leave some nests untouched. Leftover residue is far greater when using sprays, dusts, or aerosols than with fumigation. Areas that are fumigated have less toxicity, making it ideal for sensitive environments such as kitchens and food storage facilities. Having termites is an unpleasant experience, but it doesn't have to disrupt your whole world. Seeking termite fumigation in St. Augustine, FL, is the quickest and safest way to eliminate the troublesome and destructive pests.